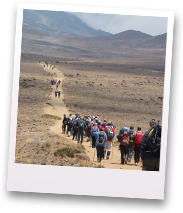 Ultimately the 5 winners will take part in a real experience of a lifetime – to climb Mount Kilimanjaro, trek the Great Wall of China, cycle from London to Paris or Hike the Inca Trail. Similar experiences to those which employees from across the RB global network have also taken on over recent years as part of the company’s efforts to raise £10m to save children’s lives around the world. Competition participants will be asked to compete against each other in an online ‘race’ to get votes for their entry. The highest scoring five contestants will get the charity challenge of their choice, with RB both covering their costs and donating funds to Save the Children, who organise this charity challenge adventure. “At RB we are passionate about two things: enabling opportunity to drive competition in the work and marketplace and focussing on our charity agenda with Save the Children. This initiative is a fun way of demonstrating to those outside of the company a little more about our culture, and the way we like to think and work as well as contributing to Save The Children’s important fund raising programme.” Andraea Dawson-Shepherd, SVP Global Corporate Communication & Affairs, RB plc. The Experience of a Lifetime initiative is a continuation of the company’s ‘Global Challenge’ initiative setup in partnership with Save the Children. RB has recently completed its third global challenge in Brazil, where 65 dedicated employees from 34 countries trekked through the mountainous Chapada Diamantina region in Brazil raising £300,000 for Save the Children. Experience of a Lifetime will offer five winners a similar life changing opportunity by participating in their very own charity challenge. Reckitt Benckiser (RB) is a world leader in household, health and personal care. It is a FTSE top 25 company and since 2000 net revenues have doubled and the market cap has quadrupled. Today it is the global No 1 or No 2 in the majority of its fast-growing categories, driven by an exceptional rate of innovation – typically about 35% of net revenue comes from innovations launched in the prior 3 years. It has a strong portfolio led by 19 global powerbrands which are: Finish, Lysol, Dettol, Vanish, Woolite, Durex, Calgon, Airwick, Harpic, Bang, Mortein, Veet, Nurofen, Clearasil, Strepsils Gaviscon, Mucinex, Scholl and French’s, and they account for 69% of net revenue. RB people are at the heart of the company’s success. They have an intense drive for progress and action and a desire to outperform wherever they focus, including in CSR where the company has the most ambitious corporate responsibility programme in the industry through its Carbon 20 initiative. Headquartered in the United Kingdom, the company employs about 27,000 people worldwide, with operations in over 60 countries and sales in almost 200 countries. RB is one of Save The Children’s major corporate partners and is proud to have raised £6 million since 2003, helping thousands of children all over the world but we know that's not enough. RB delivers performance in everything it does, including social responsibility. It is deeply committed to sharing some of the wealth it creates with the people who need it most and helps to improve children's health, hygiene and social development around the world. In Angola and Tanzania, the money supports health programmes which focus on babies, young children, their mothers and communities. This work is vital. Every year more than 8 million children die before their 5th birthday from illnesses that are preventable and treatable, including malaria, pneumonia, measles and diarrhoea. In April 2009, we announced our support for the Child Domestic Workers' programme in West Bengal, India. This project works with children, most of them girls, who have been trafficked to become domestic workers in some of the major cities in India. Taken away from their families, most of them suffer physical, mental or sexual abuse. Many suffer all three. We also support the Children's Emergency Fund. With money already in place, Save the Children can act as soon as disaster strikes, without having to appeal first. Our annual corporate donation of £100,000 means that we have helped many desperate children in emergency situations like the recent floods in Pakistan, the earthquake in Haiti and the famine in Niger. As a business RB raises funds in different ways including: corporate donations; large fundraising events such as the RB Global Challenge – where our own staff take up exactly the same challenge we are offereing now, charity golf days and group fundraising initiatives such as product sales, wine tasting, treks, auctions, raffles, dress down days and quiz nights, and a charity gold day. Many staff fundraise also choose to take up personal challenges such as running marathons or other races, swimming, or simply baking cakes. Save the Children is the largest independent children's charity worldwide. With support from RB and many others, they are able to continue their vital work in five specific areas: health, education, freedom from hunger, protection and emergency response. Save the Children is the natural choice as RB's global charity partner as it reflects RB's passions as a business. Not just because their programmes focus on health and hygiene. The family is central to both Save the Children and RB's consumers. And as one of their largest corporate supporters worldwide, RB is as committed as ever to supporting their tireless work. This press release was distributed by ResponseSource Press Release Wire on behalf of The Firm in the following categories: Men's Interest, Entertainment & Arts, Education & Human Resources, Media & Marketing, for more information visit https://pressreleasewire.responsesource.com/about.